There's a new set in front of the camera here at the studio, ready to be shot, and it's an art gallery. Here's the step-by-step process of how it was created..
First, it began as an idea. Signe says that "in the Soviet Union religion was banned and the Soviet government solved the problem of what to do with unused churches by converting them into atheist clubs or art galleries. There was an old orthodox church in Riga that was turned into a planetarium with an adjoining café where all kinds of bohemians hung out. The café's nickname in those circles was "Dieva Auss" which means "God's Ear". In the Latvian system of metaphors Gods Ear is a heavenly place to be - it's warm, fuzzy and your wishes are instantly heard." In "My Love Affair With Marriage" the main character, Zelma, enters a gallery where she meets an older artist and she is instantly seduced by his aura of success and importance. Signe based the visual idea of this gallery on the converted church. The space of Art is sacred to young, inexperienced Zelma and people associated with it can do no wrong. Since this gallery used to be a cathedral, it has some high arches and niches in the walls for art, where the religious statues used to be. The whole set started with this sketch that Signe gave to Sturgis. From simple beginnings come very complex ideas! Sturgis used 3 kinds of saws to cut the shapes from wood found in a carpenter's trash bin. 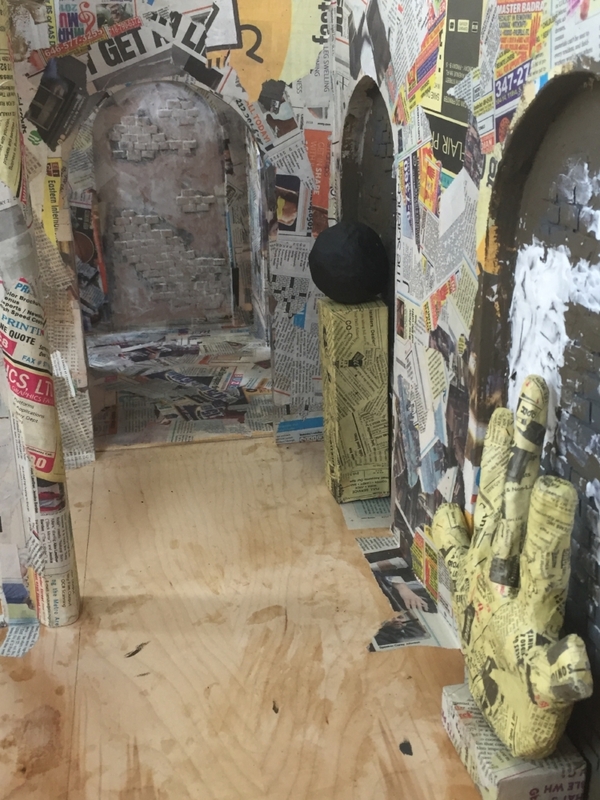 The constructed set, with high arches and niches for the artworks, gets covered in paper-maché and with bricks made of cardboard. Signe places a sample piece of art to show us how the gallery might look when it's finished. Close-up of the right wall of the gallery with a hand sculpture in place. The paintings and sculptures exhibited in the gallery are created by the intern Joon Young Park. He did an amazing job! By mid-May the whole gallery had been painted, bricks highlighted to bring out their texture, and all of the artworks were put in place. The finished set, placed in front of the camera and lit for dramatic effect. The left side of the gallery, with artworks placed on the walls and sculptures placed in the niches. The right side of the gallery, with artwork on the walls and the finished hand sculpture.